Now that Avengers: Infinity War and Ant-Man & the Wasp are in the rear view mirror, Marvel is ready to turn the page towards their next big thing. We'd heard the first promos for Captain Marvel might start dropping in early fall, and right on schedule star Brie Larson is teasing the first official look tomorrow! Doubtful we'll get a trailer just yet, but maybe the first official image of Larson suited up as Carol Danvers? Can we also get Jude Law as Mar-Vell, please? 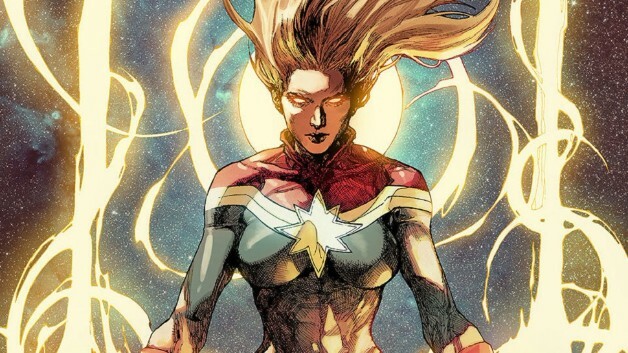 What we know is that the film is set in the '90s and follows Air Force pilot Carol Danvers whose DNA is bonded with that of an alien, giving her amazing superhuman powers. The film is set in the 1990s and will feature a digitally de-aged Samuel L. Jackson as Nick Fury, Lee Pace as Ronan the Accuser, Djimon Hounsou as Korath, Gemma Chan as Minn-Erva, Clark Gregg as Phil Coulson, plus McKenna Grace, Annette Bening, Colin Ford, and Ben Mendelsohn in unspecified roles. Captain Marvel hits theaters on March 8th 2019, directed by Ryan Fleck and Anna Boden.